Home › Short Stories › Look at the Fool: Book Week Scotland – Flash Fiction. Look at the Fool: Book Week Scotland – Flash Fiction. It’s Book Week Scotland! A most delightful time of year run by the lovely people are at the Scottish Book Trust. And although I’m sadly too busy in the run up to a holiday to go out and take part in any of the oodles of fun literary stuff going on in Edinburgh, I would sugggest you do! I did have the joy however of submitting a story to the University of Aberdeen book week Scotland flash fiction competition. It’s a fun little gig, they provide you some interesting photos from their photographic archive, and then you use that as the inspiration for your piece. And as I was browsing the images, I was struck by the one below which for some reason reminded me of one of my favourite songs – ‘Look at the Fool’ by Tim Buckley. So below is the photo that inspired my writing, and at the bottom is the song that carried it along. The middle bit is the story they inspired. I hope you enjoy it, and the photo and music besides. “You kent ya’s been a fool Tommy?” Da says, droppin’ his hond tae rests aboot ma shou’ders. “Aye Da’, the sea telt me.” I can still mak oot the whispers between each wave. The celt wata rushes up betwa ma toes. Wi’ a tickle it rushes awa’, leavin’ me alane. Alane wi’ that hond on ma shou’der. “Ya kent why though?” Da’ asks. My toes curl intae the sand, teeth crunchin’ tae’gether. 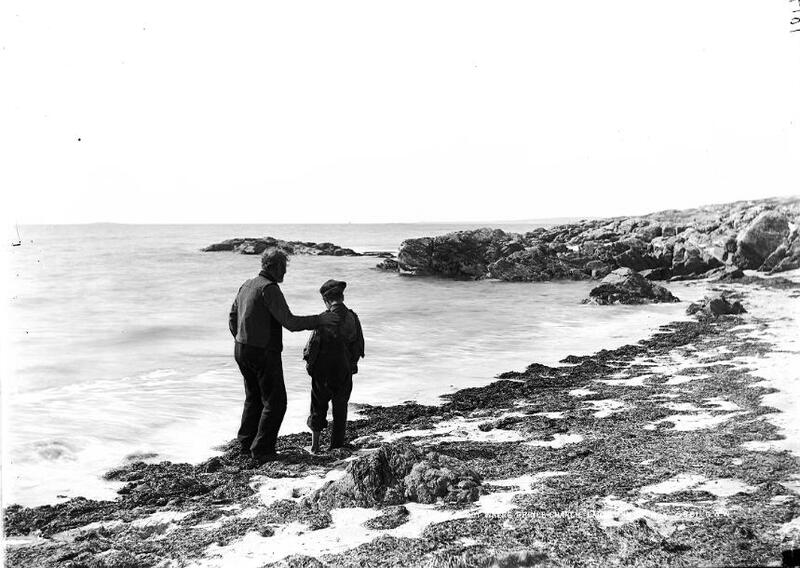 I wanted them tae shatter, fall intae the seaweed and be washed awa’ wi’ ma pain. The wata brushes ma feet. “Disnae mean I have tae stop,” I whisper. It’s just the hond again. Da’ sighs, the hond droppin’ fae ma airm. The brush o’ his breath tickles ma ear like the sea curlin’ roond ma feet. “She widnae want ya like this Tommy,” Da’ says. He digs his ain feet doon intae the sand, hidin’ fae the sea as it rushes back toward us. “Ma choice tae make though.” I dip doon, washin’ ma honds in the salty wata. The sea feels celt but warm at the same time. Ken like a soft blainket ya’s just tak fae the chest. It feels queer at first, but ya can tell if ya’ just ho’d still fae lang enough it will be ok. But the wata rushes awa’ afore the blainket settles. “Wa’s the plan Tommy?” Da’ asks. I ken he wants tae ho’d ma shou’der again. That was her job though. That was what she had tae do. A gull circles up high, cawin’ out ower the sea. The sea dosnae answer. There’s on’y yin whisper in the swirlin’ froth o’ salt and wata. And I can feel the wata rushin’ doon my cheeks too, curlin’ up ower my lip tae drop tae the ocean below. “Here Tommy, we’ll mak it ok. You’s got tae be strong like she wanted,” Da’ says. His voice cracks at the end though. His shou’ders twitch, a hond reachin’ oot like he wants tae tak’ me in. The wata rushes oot toward’ the horizon. As the celt wind rushes in where the wata left behind my da’ stops, his honds hoverin’ between us. “Ken Tommy, how lang ya’ plannin’ on stayin’ doon here?” he asks. His voice is tired, shattered by what was here. Shattered by what wasnae. “’’til she comes back,” I finally reply. As I speak the tears drip doon intae ma mooth, the salty breath o’ the sea rushin’ in behind. Da’ tak’s the words in, then steps ower tae me, wrappin’ me up in his airms. “Ken. I’ll wait wi’ ya’,” he replies. His airms are warm aboot me. The wata is celt aboot ma’ feet.